, in medieval history, members of the military and religious order of the Poor Knights of Christ, called the Knights of the Temple of Solomon from their house in Jerusalem. ..... Click the link for more information. ); it may have been of Greek origin. Image of a Baphomet, with a pentagram on his forehead, 1896. Courtesy Fortean Picture Library. In 1307, one of the accusations leveled by Philip IV of France against the Knights Templar, in an effort to lay his hands on their enormous wealth, was that they worshiped an image in the form of a human skull named Baphomet. Supposedly there were a number of these skulls, or even whole human heads, one kept at each of the Templar centers. The name Baphomet is of unknown origin. It has been suggested by Montague Summers that it comes from the Greek words baphe and metis, meaning "absorption into wisdom." Others see it as a corruption of the name Mahomet (Mohammed) to Bahomet in Provence, home of the Cathars, or Albigenses, with whom the Templars are sometimes linked. As a result of the attacks on the Knights Templar, their leader and Grand Master, Jacques de Molay, was burned at the stake. He was accused of worshiping the devil, of heresy, and of homosexuality. Under torture, only twelve of the 231 knights examined admitted to knowing anything of the head or skull. Some described it as simply a skull, some said it was a head made of wood, some a head made of metal. It was also variously described as having feet or breasts, or being bearded. However described, the consensus seems to have been that it was worshiped and regarded as a bringer of fertility and abundance. Joseph von Hammer-Purgstall believed that the Knights Templar were, in reality, "Gnostics," or secret heretics. He referred to objects of thirteenth century art, consisting of various statues, goblets, and coffers, depicting androgynous figures, often with a skull at the feet, and displaying the symbol of the pentagram. As drawn by the nineteenth century French magician Eliphas Levi, Baphomet was a humanlike figure with a goat's horned head and hind legs, and with bat's wings. A torch stood between the horns, a caduceus rose as the phallus, and a pentagram was inscribed on the goat's forehead. Doreen Valiente points out that there were similarities between these depictions, descriptions of the Templars' Baphomet, and deities acknowledged in Witchcraft. For example, Wiccan deities are thought of as fertility figures, or bringers of life. They are associated with a horned god and with a goddess. In addition, the pentagram is used by Witches. Valiente goes on to point out that there are frequently "inner circles" to magical orders. Such may have been the case with the Templars, judging from statements like that of one of the accused, Stephen de Staplebridge, who admitted to there being "two professions in the order of the Temple, the first lawful and good, the second contrary to the faith." He was admitted to the inner "profession" a year or so after his original initiation into the Templars. It was not unusual for deities to be thought of as androgynous. One of Dionysus's titles was Diphues, or "double-sexed." Mithras was sometimes so presented. The Syrian god Baal was also sometimes presented as androgynous. Aleister Crowley took the name Baphomet, as a member of the Ordo Templis Orientalis, a secret society focused on sexual practices, formed in Germany at the end of the nineteenth century. Although the Eliphas Levi drawing is popularly reproduced and often associated with Witchcraft, through the symbolism mentioned above, it actually is not a part of Witchcraft per se. Some individual Witches acknowledge it as a representation of a Wiccan fertility deity, while others abhor it. One current theory is that the head called Baphomet was the embalmed head of Christ and another has the Templars as custodians of the Holy Grail, which came to them ultimately by way of Mary Magdalene and which they eventually hid away in Scotland. There is a whole series of identifications that have nothing to do with history, but are interesting: that aringarosa means red herring, that James Faukman is Langdon's editor in the book, whereas Jason Kaufman is Brown's real editor, and that Baphomet may be derived from Muhammad. Critico e traduttore di classici greci e orientali, gia autore de La democrazia e l'arcaico (Bologna: Arianna, 1999), Marano qui sottopone a verifica l'ipotesi che la letteratura, soprattutto la poesia lirica, possa avere una relazione di contiguita e complicita con l'esoterismo: "Azzardo la tesi che la poesia non sia altro che un inconsapevole sacrificio offerto a una sorta di baphomet, termine la cui etimologia e messa in rapporto dall'interpretazione alchemica con la luna (mene) e la madre (met), cioe (ancora) con la terra" ("La comunita notturna" 190). Because certain white witchcraft religions worship a "horned god", usually Cernunnous or the Green Man, there is often confusion caused by mistaking the Wiccan "Horned God" with the satanic god Baphomet. Readers will learn of the relationship of John the Baptist and the Mandean from Sri Lanka; the mystery of Baphomet (the Templar "Demon"); the gnostic and sexual tantric rites practiced by the Knights Templar; the alchemy and mystery of the Black Madonna; secrets of the Rosslyn Chapel and the Sinclairs of Scotland; the mysteries of the Freemasons and Johannites; and the Knight Templars of today. 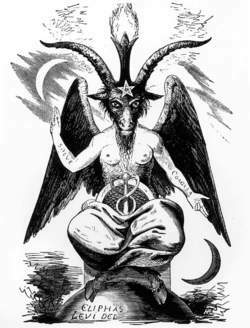 His chief picture of reference is Baphomet represented in the nineteenth century by the occult figure of Eliphas Levi, alias Alphonse Louis Constant. The details must remain a secret between myself and my colleague Baphomet, who befriended the Templars. Which is fortuitous, because it just happens that although the demon Baphomet was bound by King Solomon, under instruction from Archangel Michael, in a headshaped receptacle and kept safe for several millennia, the bounds are weakening and only a human can reinstate them. Garcia Ponte estudia las obras de Robert Musil: El hombre sin cualidades y la realizacion del amor, algunos cuentos de Jorge Luis Borges, como Nueva refutacion del tiempo, El hacedor, El aleph, Las tres verdades de Judas, El Zahir, Pierre Menard, autor del Quijote, Vindicacion del falso Basilides y Los Teologos, y de Pierre Klossowski El Baphomet, La vocacion suspendida y la trilogia titulada Las leyes de la hospitalidad, integrada por Roberte esta noche, La revocacion del Edicto de Nantes y El apuntador. Despues publica una quinta novela, El Baphomet, cuyo tema es la persecucion de los templarios acusados de homosexualidad, tal como ocurrio hace mucho tiempo cuando la Inquisicion todavia tenia un poder absoluto. As far as what the heresy was, all sorts of wild tales were adduced -- that Templars spit on the crucifix during their rituals, that they worshipped a demon named Baphomet, that they practiced witchcraft, that homosexuality among members was approved, even that during the initiation rite new members were required to kiss the presiding officer in an obscene place. The Satanic Temple, a humanist group that works to defend church-state separation, announced plans to create a statue of Baphomet, a goat-headed deity associated with the occult, to stand alongside the Ten Commandments.